Dirty Modern Scoundrel has highlighted the JR James Archive on Flickr. James was Professor of Town and Regional Planning and Chief Planner at the Ministry of Housing and Local Government and took a huge amount of photos of British architecture, and by the looks of things had a particular interest in brutalist architecture. The collection, brought together by the University of Sheffield, has loads of photos, maps and plans and is a very good way to lose a few hours as you work your way through this chronicle of post-war British town planning. As a born and bred South East Londoner I sought out the photos of Thamesmead, that post-war housing project that didn’t quite go to plan. I grew up just down the road, so the photos are pretty nostalgic. I remember playing there a few times and we often went to the supermarket and swimming pool there. While the buildings are (or, in the case of those since torn down, were) very distinctive, yet they are also very familiar. I remember being driven past them as a kid, and making my way along the walkways from time to time, remember seeing the high-rise flats mark the horizon from a nearby park. 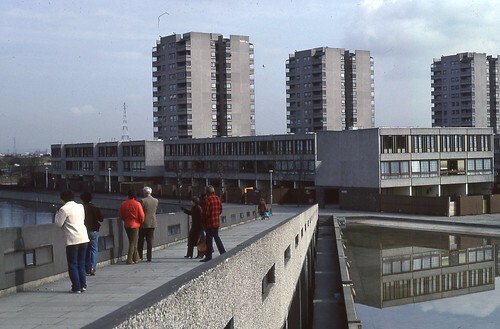 I guess if you grew up in or near Thamesmead your reaction to the place is going to be a little different to those looking at the place for the first time now. But these images also conjure up feelings of a place that could be quite scary and bleak. 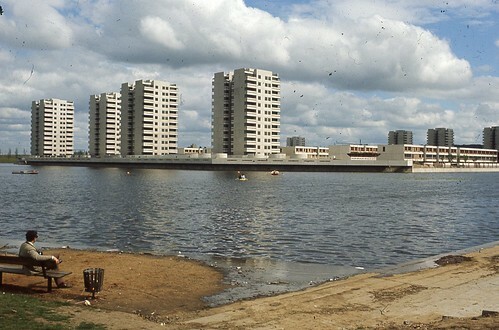 Thamesmead was never quite the modernist utopia it might have been. At one time there had been plans to extend the Jubilee Line with a station at Thamesmead. If that had happened perhaps the town might have been more appealing, might have been a success story like the Barbican. Instead it was neglected, forgotten. A town hidden away on the edge of London, on the way to nowhere. There was a lot of deprivation. Not everything was well-built, or well-considered. The town lacked infrastructure, or a proper feeling of community. I remember falling asleep on a nightbus, missing my stop and ending up in Thamesmead. I had to walk through there in the early hours to get myself home. A very evocative walk, but a pretty nervy one too. In recent years brutalist architecture has had something of a renaissance, has been fetishised, re-evaluated. I can see the appeal, especially when compared to the horror of the current new-build homes that are built without imagination or ideology or thought – build ’em up cheap and sell them at a premium. 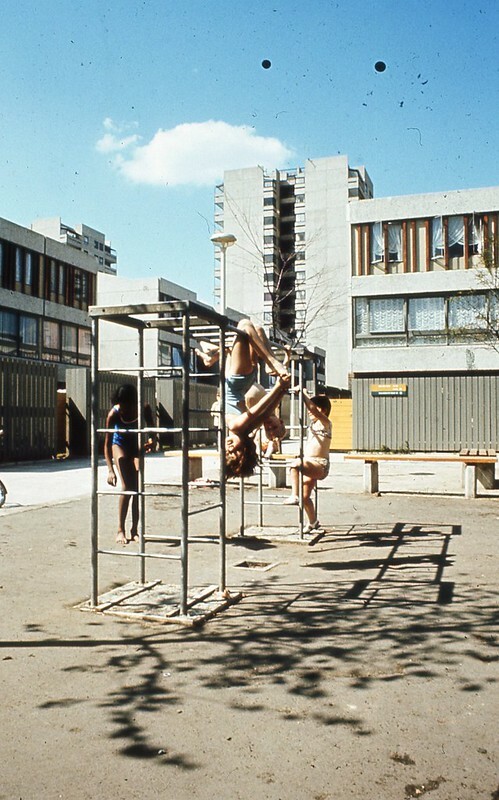 Yet places like Thamesmead make for a more complex narrative of the brutalist experiment. There is more to the tale than the future we never had. These photos offer a glimpse of the hope such places might have offered, yet maybe didn’t fulfil. This was a really nice post. I was thinking it was going to be a link to the archive, but it turned into something personal and really nice. I’ll be honest–all this looks like a foreign planet to me. Cool stuff. It is certainly a strange looking place! It is one thing seeing odd buildings designed in that style, but a whole town like it is pretty weird.